Another good entry of cattle on offer saw sows selling to £172 per 100kgs. Bullocks and bulls selling to £1,385, £630 over £1 and £292 per 100kgs, heifers selling to £1,285 and £605 over £1. Fat cows sold up to £172 for a 665kgs Aberdeen Angus offered by Jas Lowry, Bready. Bullock and bull prices: J B A McLaughlin, Claudy 785kgs, £1,385, 700kgs, £1,325 and £1,300, 725kgs, £1,290; A McConnell, Gortin 590kgs, £1,220. A Clogher farmer 620kgs, £1,235, 575kgs, £1,175. A Strabane farmer 535kgs, £1,000; W J Marshall, Fyfin 525kgs, £970 and £900; John Blair, Strabane 490kgs, £945, 475kgs, £925, 445kgs, £850. M Lynch, Omagh 360kgs, £925 (£275 per 100kgs) 380kgs, £885 and £870. C McElchare, Castlederg 520kgs, £875. G J King, Omagh 420kgs, £830, 390kgs, £820, 400kgs, £790. Weanling prices: G Sproule 295kgs, £860 (£292 per 100kgs ), 320kgs, £865, 295kgs, £740, 220kgs, £520, 240kgs, £650. Peter Devine, Donemana 340kgs, £795, 300kgs £725, S M Slane, Omagh 300kgs, £725. Heifer prices: W J Kee, Strabane 710kgs, £1,285, 605kgs, £1,140, 575kgs, £950. K McMullin, Gortin 550kgs, £1,150, 550kgs, £1,130, 560kgs, £1,150, 520kgs, £1,100, 530kgs, £1,085, 500kgs, £1,080. William McKean, Sion Mills 600kgs, £1,100, 570kgs, £1,100, 520kgs, £1,095, 540kgs, £1,085; C McElchare, Castlederg 640kgs, £1,105, 600kgs £1,110, 590kgs, £1,050, 500kgs, £920. John McConnell, Gortin 520kgs, £1,125. A Strabane farmer 550kgs, £990. R J Gallagher, Omagh 520kgs, £965. 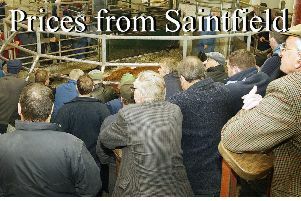 John Blair, Strabane 520kgs, £870; M Lynch, Omagh 385kgs, £835. Weanling heifers: Stephen Murray, Fintona 360kgs, £750, 285kgs, £700, 280kgs, £650. G Sproule, Castlederg 325kgs, £670, 180kgs, £445, 220kgs, £555. Sheep sale: Fat hoggets - K McMullin 27.5kgs, £101; K Quinn 24.8kgs, £100; 23.5kgs, £98.50; Mrs S Moore 28.5, £100; L McNeely 29kgs, £100; 26kgs, £98; S Robinson 23.6kgs, £99. A Torrens 23.5kgs, £97.50; 23kgs, £95; M E Clarke 22.5kgs, £95; 21.5kgs,£91.50; 19.5kgs, £85; D Love 27.5kgs, £98; 25.6kgs, £95.50; John Blair 23kgs, £91; C F Kee 22.5kgs, £90 and J R Stafford £101 and £84. Fat ewes: K Quinn £100 and £75; Mrs S Moore £95 and T Robb ram £90.